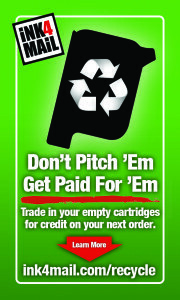 Ink4Mail.com accepts empty HP and Kao Collins cartridges for recycling. 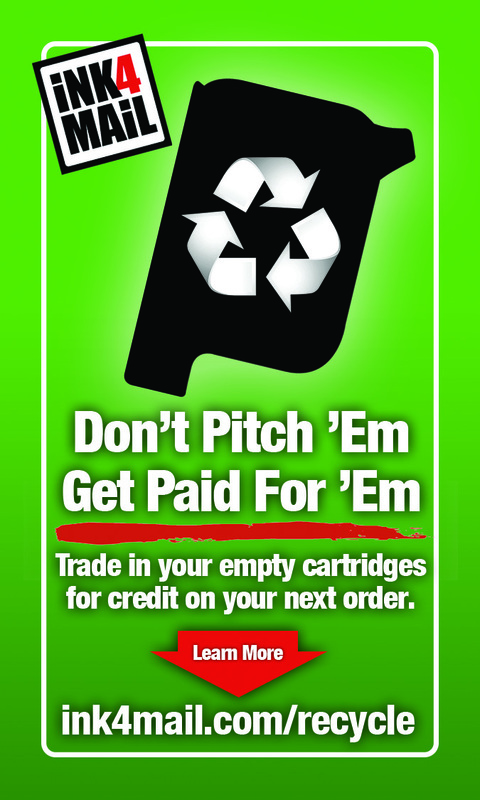 If you recycle 150 or more cartridges, we will credit your account $1.00 per cartridge for HP / Collins, and 50 cents per cartridge for other recycled / remanufactured cartridges. If you gather 50 or more empty HP and/or Collins cartridges, Ink4Mail.com will pay for the shipping. For each cartridge you return to us, you will receive a $0.75 credit on your next order. Remanufactured (non-virgin) ink cartridges can also be recycled….however, because they have already been re-filled, the failure rate is higher. These remanufactured cartridges will be subject to onsite inspection and an amount of credit will be determined based on the condition of the cartridges. Previously recycled / refilled cartridges are eligible for a 25 cent credit per cartridge if you return at least the minimum of 50 cartridges. Please fill out the form below with your details, so we can send you labels for your recycled cartridges. Thanks. For more information continue to check our website or call us at 1-866-INK-CART.